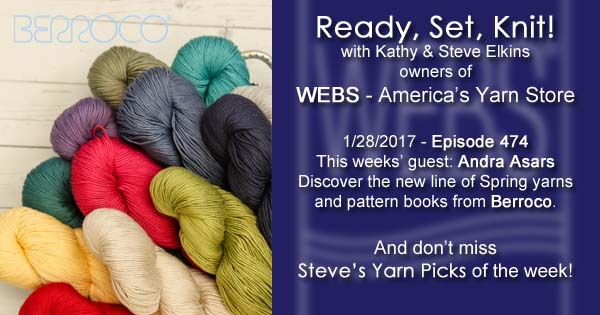 This week Kathy talks with our beloved Berroco Rep, Andra Asars about the new Spring line from Berroco. Suede and Plush are back! You can make those adorable baby Ugg booties again or explore all new designs in Berocco 383, a dedicated Suede pattern collection. Berroco has put some of their original Suede patterns up for free! 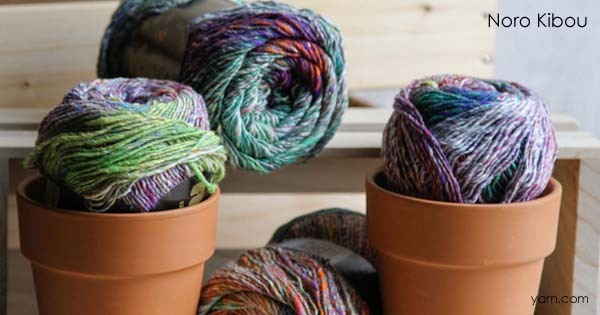 All new Ultra Wool, perfect for your favorite worsted weight patterns! Remix Light isexactly what you’ve been looking for if you want a tweedy yarn with no wool, and Berroco 386, the Remix Light dedicated pattern book. Summer Silk, and Book 384 full of transitional seasonal garments and accessories. Nebula is a slow shifting gradient-type yarn with tons of yardage! Check out Andra’s Get into the Groove Shawl, striped with Folio. An ideal yarn for summer, Pima 100 and Berroco 385, a dedicated pattern book full of classic summer garments. 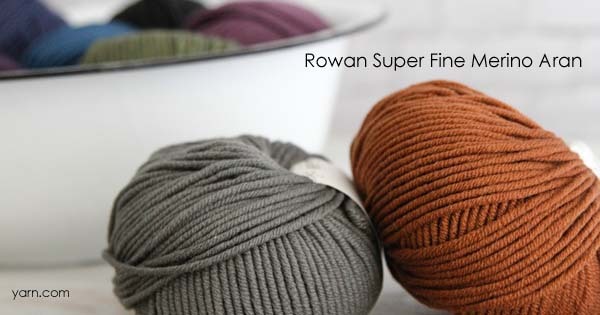 Modern Cotton DK is the lighter weight version of the favorite Modern Cotton and both are featured in Portfolio 3. All new books Corsica Vol.2 and Mykonos Vol.2. And don’t forget to sign up for Berroco’s Knibits e-newsletter! Our Big Game Day Escape is happening February 5th from 12-4, register now! Registration for WEBS FAll Retreat will open on Wed Feb 8th at noon, check the Ravelry group – “WEBS Knitting Retreat” for more info. 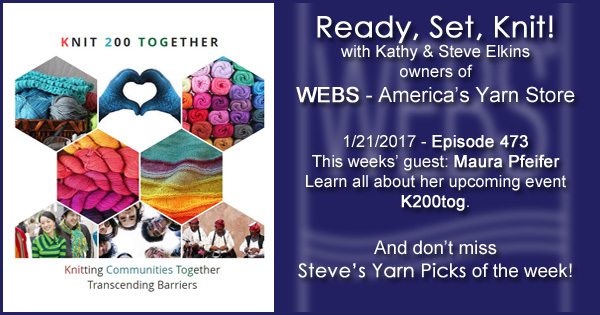 This week Kathy talks with Maura Pfeifer, founder of K200tog. Maura is working to bring people together, and sees this as an opportunity to get outside of our daily bubbles and find out what we have in common. The K200tog Event happening on Saturday, Feb. 11th from 1-5pm at the Cary Memorial Library in Lexington, MA. You can register here. There are 125 spots. You will need a credit card as registration is online only, no phone calls, no Paypal. There will be a private shopping event for retreat attendees on Saturday night at the store as well as lots of late night knitting, swag bags, gifts and giveaways! Thanks to our early sponsors, Classic Elite Yarns, Berroco, and Tahki Stacy Charles! Malabrigo Rueca – now available ONLINE! 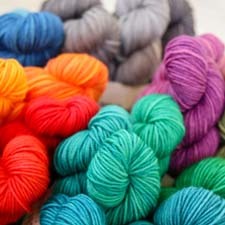 New Designs in Valley Yarns Colrain! 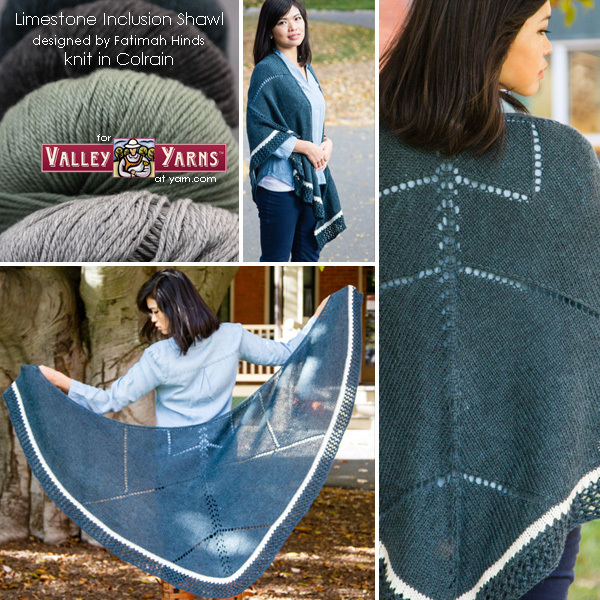 Three talented designers have all worked with our Valley Yarns Colrain to bring your all new designs for January! The Sabine Pullover from Ashwini Jambhekar, who also designed the Ascending Leaves Pullover, has faux princess seams created with a small slip-stitch cable to a truly flattering fit. Melissa Metzbower, who also designed the Honeycomb Child’s Cardigan, designed the clever January Morning Cowl. 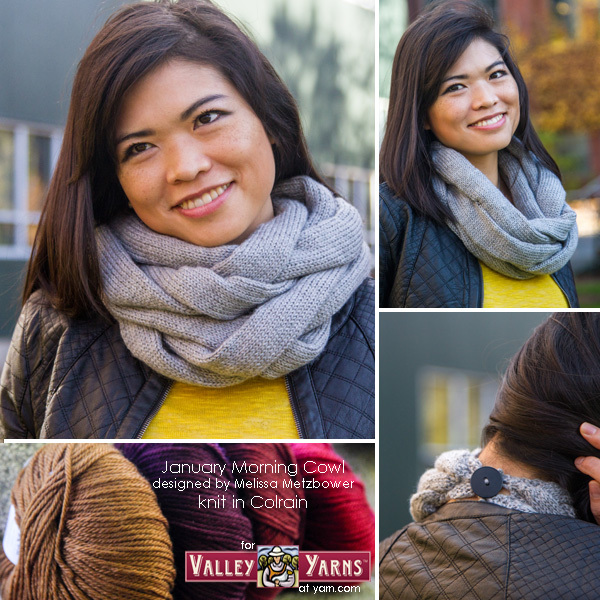 Squishy, cozy braided strips join together at the back neck with a low-profile button. Fatimah Hinds, designer of the Blue Quartz Cowl, has created a subtle graphic statement with the Limestone Inclusion Shawl, which features a simple stripe of natural to transition from the main body to the lacy, mesh edge. 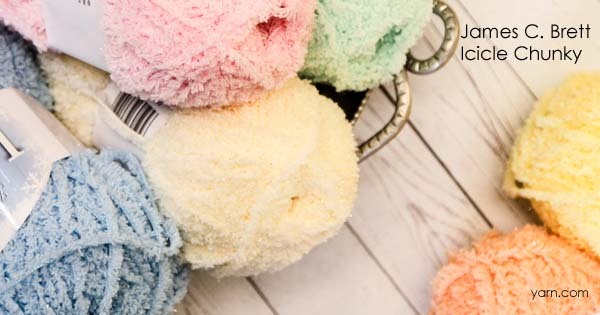 Have you worked with Valley Yarns Colrain before? What has been your favorite project? First Watch Pea Coat – Winner! Our thanks to everyone that commented and said such lovely things about Marie’s newest design. And we love all your color choices! Our winner is Commenter # 242, Anne, who said, “I think I would use the gold…bold and bright for these endless cloudy winter days. I have followed WEBS forever, catalogue and then on FB and online. I even had the pleasure of visiting the store a few years ago. Yay, WEBS! 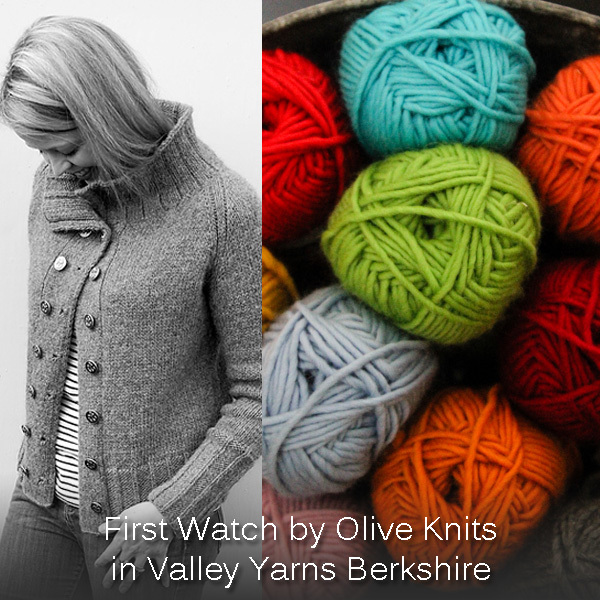 !” Anne will be getting a sweater’s worth of Berkshire in her chosen color and a copy of the First Watch pattern! There are already so many great projects popping up on Ravelry, we can’t wait to see all of your versions of this sweater in all these amazing color choices! Our thanks go out to Marie for designing such a lovely sweater in Valley Yarns. Valley Superwash stuns in Vogue Knitting! 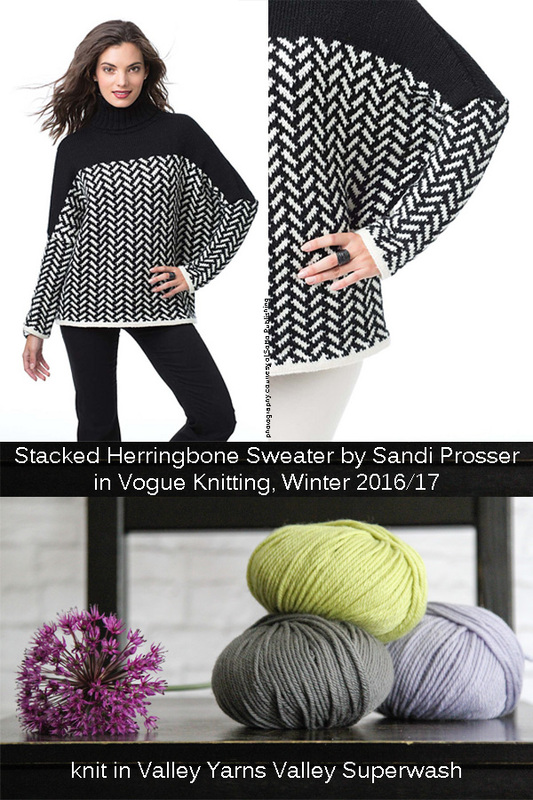 The Winter 2016/17 issue of Vogue Knitting is on newsstands now and we’re thrilled with the Stacked herringbone Sweater from Sandi Prosser! Knit in two high contrast colors of our very own Valley Yarns Valley Superwash, this oversized, batwing-style sweater creates a bold, herringbone pattern for a pullover that would look equally at home with jeans and boots, or a black mini and stilettos. I can’t wait to see it in other color combinations! Which colors would you choose? 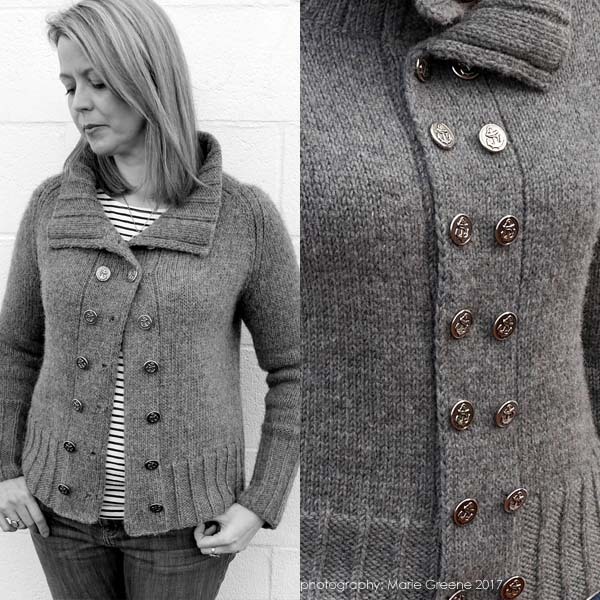 First Watch Pea Coat – new design and a giveaway! 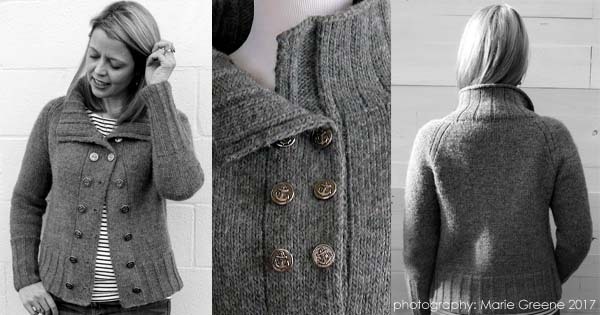 Marie Greene, from Olive Knits has just released a new design knit in our Valley Yarns Berkshire. Her First Watch Pea Coat is a lovely modern take on the classic pea coat, with subtle, crisp details that make this sweater a classic piece that you will wear for years. We asked Marie to share the story of this design. For me, knitwear design usually always begins with a structure or a place – a bridge, a coastline, an outdoor marketplace. I am always open to inspiration in unexpected places, and more often than not it’s the littlest things that kick off an idea. First Watch was inspired by my home near the Oregon Coast – a place where the ocean breezes can cut right through several layers (even when you think you’ve bundled up enough). I’ve always loved the minimal style of a pea coat; it’s a perfect example of form and function, and this one – knit with Valley Yarns Berkshire at a relatively dense gauge makes for a toasty fabric that holds its own on a cold day. The yarn blocks beautifully and provides clear stitch definition for ribbing and details. The result is a sturdy, totally wearable piece that you’ll find yourself reaching for again and again throughout the cold season. Best of all, it’s a quick, seamless knit with the button band worked right along as you go. Designed for sizes 32-52 with a little ease for layering, First Watch is a versatile piece that you’ll love so much you’ll wear it every time the temperature drops. I have to agree with Marie, I love it, and I just have to decide what color of Berkshire I’m going to use. For more info on Marie or her Olive Knits designs please follow her on Ravelry or Instagram. THANKS TO EVERYONE THAT PARTICIPATED! This Giveaway is now closed. Now for the Giveaway! Tell us what color of Berkshire you’d like to use and where you heard/saw about this giveaway in the comments and you’ll be entered to win a copy of the pattern and a full sweater quantity of Berkshire to knit your own First Watch! The giveaway is open to residents of the US and Canada, and closes at 11:59pm EST Sunday, January 15th. Please use a valid email address when creating your comment account, anonymous comments prevent us from contacting you if you are the winner. The winner will be chosen using a random number generator, the comment with that number will be the winner. If the winner has not responded to requests after 1 week a new winner will be chosen using the same method. 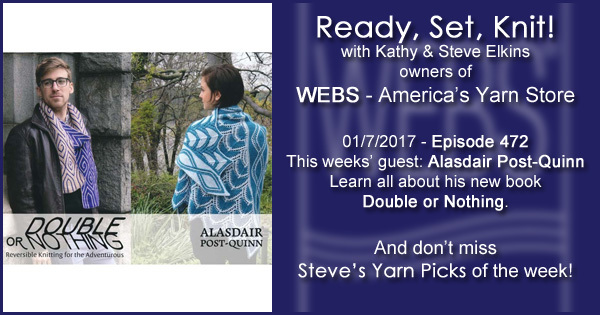 This week Kathy talks with Alasdair Post-Quinn about his newest book, Double or Nothing. Alasdair explains why knitters shouldn’t be intimidated by double knitting, it’s no more difficult to do than 1×1 ribbing! If you’re still nervous you have the chance to come take a class with him at WEBS in April! Intro to Double Knitting section 1 or section 2, Knitting Off the Grid or Multi-Color Double Knitting. 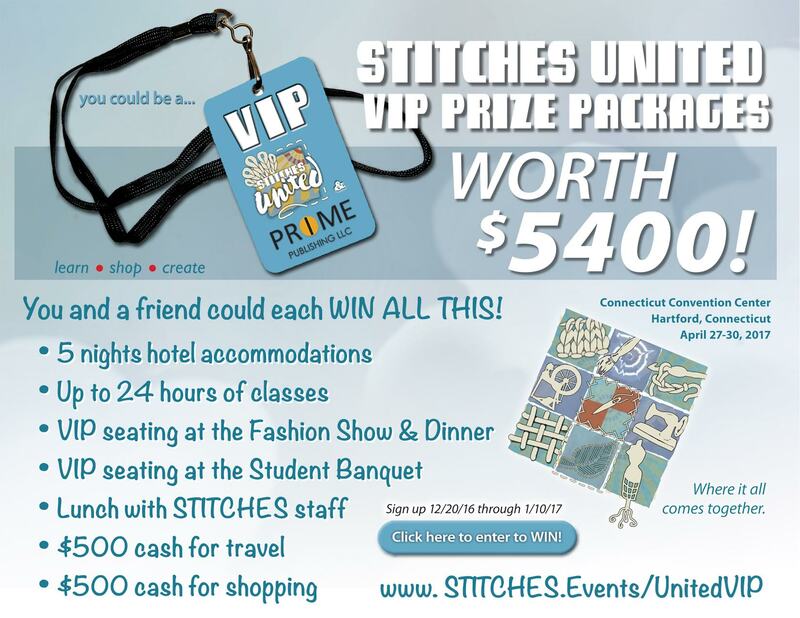 And don’t forget to enter for your chance to win a VIP trip to STITCHES United in Hartford in the Fall. Enter here through January 10th. Red Cross Blood Drive at the store this Thursday, January 12th! The beginning of the new year is a great time to start a new project, maybe something just for yourself! The Anouk Cowl, designed by the incredible Dora Ohrenstein, is a unique combination of stitches and technique that results in a easy accessory with gorgeous texture. Crocheted with our 2/10 Merino Tencel, this cowl has incredible drape and a shine that peeks out from behind the soft merino haze. Get your hooks out and crochet this beauty for yourself now! STITCHES United – you could win! Our friends at STITCHES are running an amazing contest for the STITCHES United show. You and a friend could win a total VIP experience! Click here or below to enter The Ultimate STITCHES United 2017 VIP Giveaway. And if that weren’t enough… the winner will get to select a friend or family member to receive the same package! You have until January 10, 2017 at 11:59 p.m. (central time)to enter. On January 11, 2017 the winner will be announced. And the hidden bonus? Everyone who enters will receive a coupon for 50% off admission to the STITCHES United 2017 Market, you Can’t Win If You Don’t Enter!